Good Friday – we remember Lord. Thank you Jesus, for becoming the Passover Lamb! 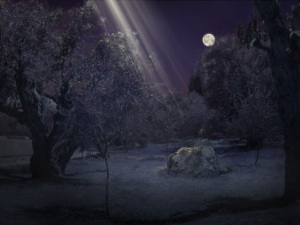 Gethsemane – what does that mean? Gethsemane is a corruption into English of two Hebrew words GAT and SHMANIM. It is taken to mean “the place where olive oil is pressed”. Now, here is a further insight into the Hebrew words GAT and SHMANIM. GAT, as a Hebrew word by itself (Hebrew: gimel, tav), means a winepress. SHMANIN means oils, and is the plural of the Hebrew word SHEMEN, for oil. A literal translation of GAT SHMANIM would be “winepress of oils”. The Son of Man lies crumpled and torn. In a body to be battered and scorned. His life draws near to the grave. As His sweat turns into blood.